As January comes to an end and we all cheers to the passing of the bleakest and longest month of the year, all eyes turn to the month of love! Whether you are loved up, looking for love or just loving life this is a great time to show the special people in your world just how much you care! At The Spa Hotel we aren’t in to out of date clichés. 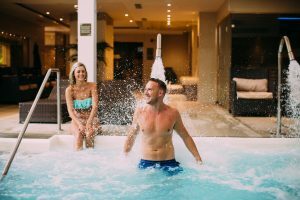 Put simply, we want you to feel loved and give love in return, so here’s our guide on how to enjoy Valentine’s Day with a little help from The Spa Hotel. Apparently the idea of roses and chocolates for Valentine’s Day has declined rapidly in the last decade and most people are looking for a unique experience to enjoy together. What fits that bill more than a Mud Rasul? 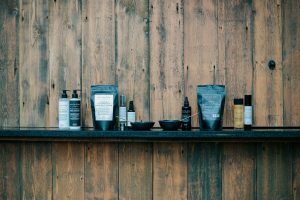 You have your very own room supplied with different types of mineral rich mud which you can spread on to yourself (or each other) and then relax and let the mud work its magic before a beautiful, refreshing shower washes you from head to toe. A really romantic experience for two that can be added on to your spa break or spa day. It has to be said that sitting across from each other enjoying a delectable meal with a glass of something special is pretty romantic The ambience and atmosphere is also key for the perfect evening. 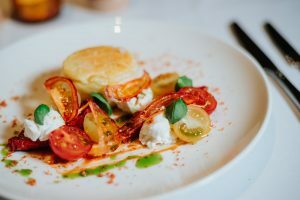 The Orangery sparks that exquisite balance between perfect lighting, attentive service and some of THE best food in Lancashire (we think so anyway!). 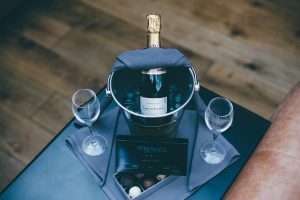 To celebrate Valentine’s Day we have curated a delicious four-course dinner which can be combined with a couple of hours in our award-winning Spa. This Spa and Dine package is just £79pp. Feast your eyes on the menu. If you’re working on Valentine’s Day or don’t fancy the idea of celebrating at the same time as everyone else, that’s ok, and in fact we have the perfect thing for you. Give your partner the gift of a Spa Hotel Gift Voucher. It can be used at any time for the following 12 months and in-fact you can them come at a time that works for you both. The recipient can choose what to spend it on, which takes all of the guess work out of it for you! Our Gift Vouchers can be bought online or over the phone and the deadline for buying them is 4pm on 13th February, just for you last minute buyers. Valentine’s Day really isn’t about how much you spend, it’s about showing someone how much you care, so don’t feel the pressure to spend more than you can afford. We said no clichés – but this one is an oldie and a goodie – “it really is the thought that counts!” So whether you make a Valentine’s Day present or buy one, just put thought in to it. You can pick up gifts at The Spa Hotel to suit a range of budgets, so call in to our beautiful Spa retail area and we will also gift wrap your gift for you too – bonus! Start a great love affair – with yourself! Let’s face it, some of us might not be in a relationship and that’s ok. Really the only person that matters is you, so now is the time for self-celebration. Put some time aside to indulge, re-charge and take part in some self-care. 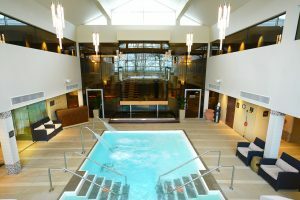 Book yourself in for some well-deserved alone time in our Aqua Thermal Journey and float out of the building knowing that all you need is you and that you are feeling the best you can feel! Valentine’s Day is such a wonderful time to ask your loved one that all important question. We’ve had our fair share of engagements at The Spa Hotel and go above and beyond to make your dream proposal out of this world. If you are enjoying a Valentine’s Spa Break or a spa experience with us for Valentine’s Day please let us know in advance so that we can help you make it extra special. We’re not sure who invented this, or even if it’s a real thing, BUT we read somewhere that the 13th February is Galentine’s Day, and we think it’s pretty cool so we’re going with it. Celebrate with the ones you never see, the friends who are like family or your best pal who needs a pick-me-up and make the most of time with your gal pals. Our wonderful Pampering and Pyjamas package combines our luxurious spa break with an ELEMIS facial and a complimentary movie and popcorn in your room – perfect for a girls night in! Yes, we said that it’s not about the amount of money that you spend, and it’s not, BUT should you have a few extra pounds to spend on that special someone don’t be afraid to go all out! There’s lots of ways we can make your spa break extra special. Add on a couples massage, order a bottle of champagne for your room, or upgrade your room to one of our executive suites, call our Spa advisors and they will help you choose the perfect extravagance for you. As a holiday, we know that Valentine’s Day is very geared towards the ladies, but let’s take this opportunity to spoil the guys in our lives too! We have some fantastic gifts for men, including our ELEMIS and Natural Spa Factory men’s grooming items. 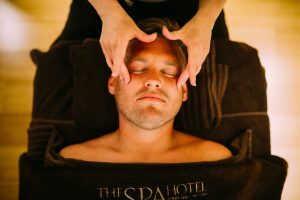 Or if you want the man in your life relaxed and refreshed why not treat them to something they may not necessarily buy for themselves such as an ELEMIS Facial for men or a deep tissue massage. We love it when you share the love. If you are joining us at The Spa Hotel this Valentine’s Day weekend share your pictures with us by using the #ilovethespahotel.